A plateful of cheesy pasta is loved by almost everyone. Pasta is not only easy to make but also filling at the same time. However, the ready-made pasta that we love is loaded with preservatives, which can lead to a number of health problems. Excessive dependence on ready-made pasta can lead to weight gain and make you feel sluggish. This, however, doesn’t mean that you need to stop eating pasta. Following a few smart tricks will help you prepare a healthy plate of pasta without affecting your health. In this blog, we list some smart tricks to make pasta healthy. The first trick is to make fresh pasta at home. Making pasta from the core is a tough task, which is the reason why most of the people prefer ready-made pasta. However, with the help of KENT Noodle and Pasta Maker, you can easily prepare fresh, healthy and preservative-free pasta at home. All you need to do is add the ingredients in the machine and use the desired die to extrude pasta. To give the pasta a healthy twist, you can also add beetroot or spinach puree with the ingredients. To make the pasta healthy, load it with different types of veggies. In fact, the proportion of veggies needs to more than the pasta. Saute some spinach, red and yellow bell pepper, cauliflower or even broccoli to the pasta to give it a healthy twist. Adding more vegetables ensures that you are eating a vegetable dish with a little bit of pasta in it. Instead of all-purpose flour, it is advisable to opt for whole wheat pasta. Whether you get ready-made pasta or prefer making it at home to avoid preservatives, make sure you switch to whole wheat pasta. Whole wheat is rich in fiber and other nutrients making a healthier option than all-purpose flour. Most of the pasta recipes that you get online advise you to cook the pasta al dente, which means you can bite the pasta. Italians have been cooking pasta this way for centuries. 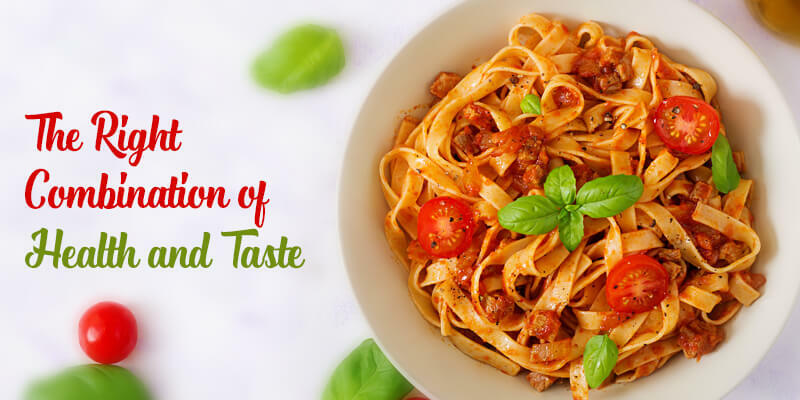 The reason is al dente pasta not only tastes good but is also easily digestible. As a result, you will stay full for a longer period and won’t reach out for unhealthy snacks. An obvious point, make sure you keep an eye on the portion size. According to USDA, an adult needs to consume only 6 ounces of grains a day. This is the reason why you need to pile up on less pasta to enjoy a healthy meal. Pasta is easy to make, which is the reason why both kids and parents love eating it. However, excessive amount of ready-made pasta can lead to a number of health problems. Following the tips mentioned above can help you give a healthy twist to your pasta so that you enjoy guilt-free snacking.